After a search that spanned nearly three months, UNLV finally named its new head basketball coach on Monday. Nope, it’s not Rick Pitino, Mike Brown, Stacey Augmon, Steve Lavin, Mick Cronin, Randy Bennett or Marvin Menzies, all names rumored to have been in play since the school fired Dave Rice back on Jan. 10 after a 0-3 start to Mountain West play. 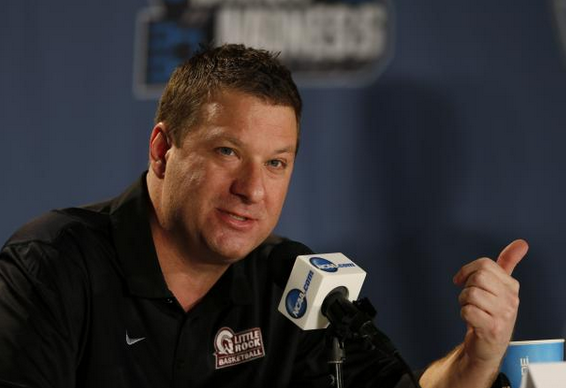 Instead, the Runnin’ Rebels named Arkansas-Little Rock’s Chris Beard as the school’s 12th full-time head coach. The contract is pending approval of terms by the Nevada System of Higher Education Board of Regents. A press conference will be held following a Regents meeting, which has not yet been scheduled. The 43-year-old Beard became a hot name after earning Sun Belt Conference Coach of the Year honors after leading Little Rock to a program-best 30-5 overall record and fifth NCAA Tournament appearance. The Trojans, who won the Sun Belt’s regular-season and tournament titles, rallied from a 13-point deficit in the final 3:33 of regulation to upset fifth-seeded Purdue, 85-83, in double overtime in the first round on the Midwest Regional in Denver. UALR then lost to fourth-seeded Iowa State, 78-61, in the round of 32. Beard also spent 10 seasons as an assistant at Texas Tech, including seven under the legendary Bobby Knight, and compiled a 47-15 record in two seasons as head coach at Division II Angelo State in San Angelo, Texas. He was named Lone Star Conference Coach of the Year after leading the Rams to a program-record 28 wins in the 2014-15 season and first-ever NCAA Division II Sweet Sixteen appearance. One of Beard’s first tasks will be finding replacements for two key starters who decided to leave the program this month. Starting forward Dwayne Morgan announced he would transfer to be closer to his Baltimore home while star 7-foot forward Stephen Zimmerman Jr. made it official on Monday that he has decided to enter the NBA Draft. The Rebels also must replace starting guards Jerome Seagears and Ike Nwamu.